PowerPoint presentation is a file format that allows you to create and show a series of slides containing text, shapes, charts, images and SmartArt diagrams with rich set of formatting options to make your presentation more attractive and memorable. 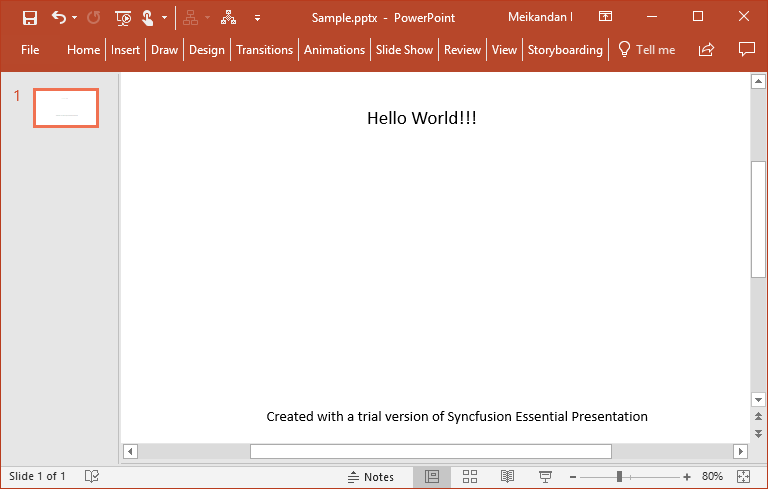 Syncfusion Essential Presentation is a .NET PowerPoint library used to create, open, read, and edit PowerPoint presentations. Using this library, you can start creating a PowerPoint file in Xamarin. 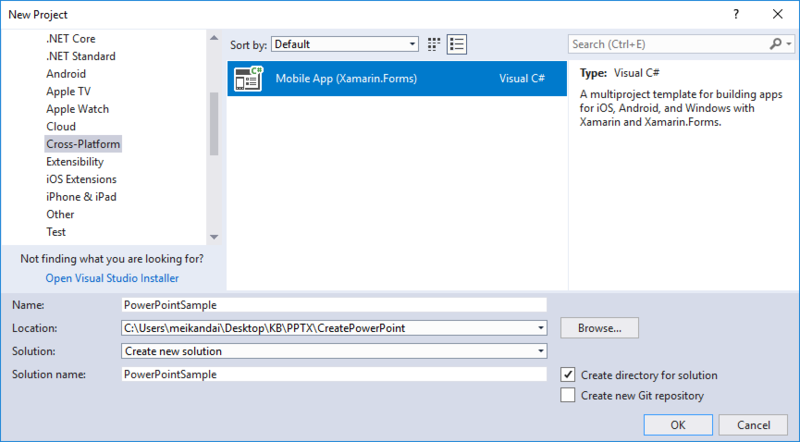 Create a new C# Xamarin.Forms application project. Select a project template and required platforms to deploy the application. 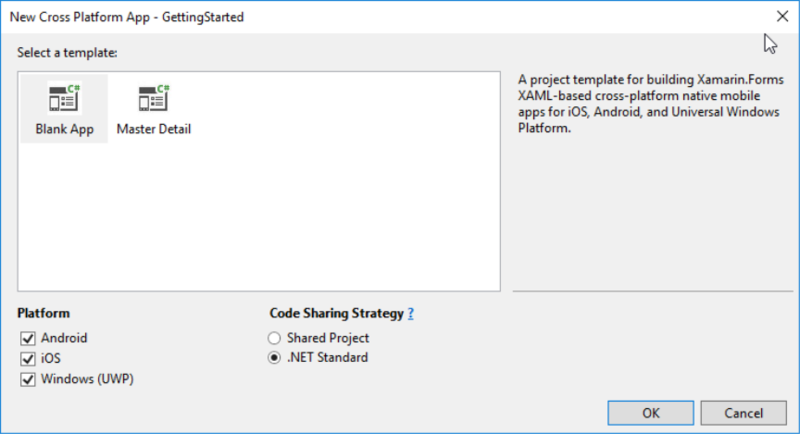 In this application the portable assemblies to be shared across multiple platforms, the .NET Standard code sharing strategy has been selected. For more details about code sharing refer here. 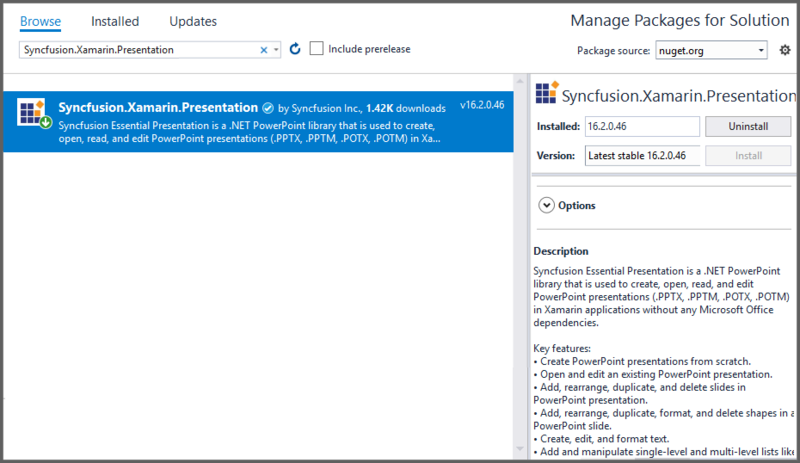 Install Syncfusion.Xamarin.Presentation NuGet package as a reference to the .NET Standard project in your Xamarin applications from NuGet.org. Add new Forms XAML page in portable project If there is no XAML page is defined in the App class. Otherwise proceed to the next step. To add the new XAML page, right click on the project and select Add > New Item and add a Forms XAML Page from the list. Name it as MainXamlPage. In App class of portable project (App.cs), replace the existing constructor of App class with the code snippet given below which invokes the MainXamlPage. In the MainXamlPage.xaml add new button as shown below. Include the following namespace in the MainXamlPage.xaml.cs file. Include the below code snippet in the click event of the button in MainXamlPage.xaml.cs, to create an PowerPoint file and save it in a stream. Download the helper files from this link and add them into the mentioned project. These helper files allow you to save the stream as a physical file and open the file for viewing. Save implementation for UWP device. Compile and execute the application. By executing the program, you will get the PowerPoint document as follows. A complete working sample can be downloaded from Create-PowerPoint-file.zip. Take a moment to peruse the documentation, where you can find other options to format the text with code examples. Refer here to explore the rich set of Syncfusion Essential Presentation features.